Why read a team blog? Why read a blogger who likes a team that’s not MINE? Learn how someone hones in on one subject. Too many hobbyists flame out, trying to collect everything. Or, even though collectors may live forever, former players don’t. While you might think you have enough money to collect one of everything and every player, you may not have enough time. Q: Super blog! What’s your background as a Cubs fan and collector? A: I used to collect anything and everything I could get but have pared down my collection since re-entering the hobby. While my overarching focus has a Cubs theme, the two biggest sub-collections involve my favorite player growing up, Ryne Sandberg, and autographed books (not just Cubs books). That is why my username on many websites (eBay, SCN, SCF, etc) is rynobooks. I have thousands of Sandberg cards (hundreds that are different) as well as many different kinds of memorabilia (pennants, programs, magazines, bobbleheads, McFarlanes, stadium giveaways, autographs, etc). After such a long break, I’m finding it difficult to remember what I have so I’m beginning to inventory everything slowly but surely (and will update that part of the collection on Sandberg Sundays). Also, I have worked and/or volunteered at bookstores and libraries for most of my adult life. That has given me to the opportunity to build my autographed book collection quite a bit. I was lucky enough to work at one particular store for a little while that must have been considered one of the key stops on a book tour because numerous bestselling authors came through in addition to celebrity authors like Leonard Nimoy (Spock), Jamie Lee Curtis, Bruce Campbell and Joe Gibbs. I’ve also noticed during in-person situations, many celebrities/athletes are more personable when presented with their book to be signed. I try to read it before hand and find a conversation point to bring up during the encounter. I grew up collecting cards but didn’t get into autographs until much later. My first IP Cubs autograph was Kerry Wood when the Cubs came to play an interleague series against the Orioles. My oldest son was about 3 at the time and we went with a friend of mine to get some autographs as the players were coming in the stadium. I had a McFarlane figure base and gave my son a ball I had brought to try to do a team signed ball. Wood got out of the cab and started walking towards the entrance. We had thought there were only a handful of ‘graphers there that day but once a player showed up, people seemingly came out of the woodwork and rushed over. I was one of the first and got the base signed, but I was afraid my son would get trampled so I picked him up and got out of the crowd. Wood kept signing as he walked and when he got to the entrance, he said “Where’d that little boy go, I didn’t get his ball.” So I put my son down and he walked over to Wood and got his ball signed right across the sweetspot. I’ve stopped collecting signed baseballs because they don’t seem to age well, but that’s one we’ll keep forever. My first Cubs TTM was Mark Grace in the early 90’s. I had read about writing to players for autographs in Beckett or SCD or something like that and gave it a try. I think I mailed out the whole 1989 team set but only got back 4-5. Q: How have you fared collecting autographs, by mail and in person? A: I haven’t been real big on sending items TTM since coming back to the hobby although I have sent out a few. And going forward with my ATCRCS, I’ll be more active soon. My first idea for a custom was a 3×5 of the Cubs “W” win flag (it’s my avatar on SCN if you’re not familiar with it). I sent a bunch of them out and asked for an inscription like “Go Cubs!” or “Cubs Win!” to players who had 90% success rates on SCN. I did include a few questionnaires that some players answered but I felt a little guilty they weren’t as personal as they could have been. I threw in some generic questions like if they were a Cubs fan (especially if they played for other teams in their career), if they followed the current game at all, the last time they went to Wrigley Field, etc. I feel that with the research I’ve done for each custom card I can ask some more pertinent questions. Quality over quantity is my new motto. And yes, I know I just mentioned Cubs and quality together, haha. Q: Are you a Chicago person? A: I am not from or in the Chicago area. I was a military brat and constantly moved as a kid. When I was in 1st grade in 1984, we lived near Moline, IL. So I became a bandwagon Cubs fan and felt the heartbreak from the get go. After 30 years though I can probably drop the bandwagon part. Luckily, even though we moved around a lot, I could always follow the Cubs on WGN. Never made it Wrigley while we were there but later when I was in high school we lived just outside Detroit. My dad bought the tickets at the beginning of the season for a game in September 1993. It was against the Marlins in their first season and it was billed as Ryne Sandberg day (perfect!). The game was on his birthday and they were giving away a Sandberg pennant. By the time the game rolled around, Sandberg was on the disabled list with a season ending broken wrist he got sliding into home the series before. Still got to see him as he was honored pregame, and I still have my pennant too! Q: How did you dream up those cool custom cards? A: I have taken my kids to a local minor league stadium several times and they expressed interest in getting some autographs. Unfortunately, a lot of these younger, Single-A ballplayers don’t have any cards yet so we have a bunch of team signed batting practice balls and programs. I had seen some great looking custom cards on SCN & SCF and thought it would be fun to try. After a bit of trial and error, I came up with a few designs, posted them on SCN for critique and made some more changes. I took them for a test drive on the minor leaguers, who all seemed to like them a lot. Encouraged by the positive reactions, I decided to make the All-Time Cubs Roster Custom Set (ATCRCS). There was a lot more trial and error, trying to find the right balance in a template that would work for both retired and current players. Even with the template, each card is very time consuming. I tend to work on them in spurts, whether it’s cutting the players out of the background of their photo, compiling the statistics for the backs of the cards or doing the research for the blurb I write on each one. As of right now, I have not sent a single one TTM for an autograph request. I have about 15-20 of them signed but they’ve all been sent out to private signings or someone I had help from at Spring Training. But even from those paid signings, I feel like I’ve gotten a good response and some have asked for copies. I have done about 100 different fronts and about 50 backs which are more time consuming. Now that baseball season has rolled around again, I see myself knocking out some more while watching some games on WGN. Q: What are your blogging goals? A: One of my goals (self-imposed, although highly recommended by my wife) when I got back into the hobby was to be more organized with it. Most of my collection has been relegated to one of the smallest rooms in my house. My wife tolerates it and even helps sometimes with getting autographs but doesn’t quite appreciate it like I think fellow collectors would. As I am organizing, stories of how I obtained a specific item or autograph have come flooding back and I thought it would be fun to document that for others. Writing up a daily blog post keeps me focused on attacking the organization battle a little at a time to keep from getting discouraged. I put together a couple of fallback themes the other day in case I’m ever stuck for a topic but so far it’s a smooth 20 minutes or so for each post. My original theme was just going to be the ATCRCS, hence the title and header photo. But as I’ve gotten organized, I realized there was much more to my collection I wanted to share. I hope people who read it are entertained even if they aren’t necessarily a Cubs fan. I aim to post daily, sometime before noon. Q: Have you gotten any of your awesome “First Pitch” cards autographed yet? A: I have not sent out any of the First Pitch customs yet. I made the Hope Solo one in anticipation of a public signing event but ultimately couldn’t pull the trigger on the fee. When looking for photos to use for the ATCRCS, I found a bunch of celebrities making the first pitch. I thought it would make for a great subset and like the regular set, it will continue to grow in size. I have thought about the 7th inning stretch too but many times it is the same person who throws out the first pitch. Also, the photos I’ve found of the sing-along aren’t as good as the first pitch. I haven’t ruled it out, but it’s on indefinite hold. Q: How are current Cubs as signers? A: All of the autographs from current Cubs I have are from the generous folks at SCN who have offered help. I live in Northern Virginia so the opportunity doesn’t come up to often. The Cubs usually play the Nationals once a season and we’ve only tried to graph them once inside the stadium. None of the current players came over but former players (coaches at the time) Ivan DeJesus and Bob Dernier came over and signed at our request. I was definitely more excited about that than my kids were who pretty much only know current players. Eventually they’ll come back to Baltimore for interleague play too. My focus has been organizing and making the customs but now that I’m back in the hobby, I will be looking for more opportunities to get autographs in person. I’m debating on whether to make a trip to Chicago in January for the annual Cubs Convention (full of current and former players) or spending a week out in AZ for Spring Training. Hmmm, Chicago in the middle of winter or AZ in the Spring??? A: The way I value my collection has certainly changed during the years I took a break from the hobby. Early on, I think I considered it an investment, only getting baseballs or photographs signed. Now, it’s definitely just a hobby with no thought to resale value. Players have signed hundreds if not thousands of baseballs and cards and photos in their careers but I love the uniqueness of custom cards. My customs were designed in the offseason and my first real go of it came in Spring Training and some private signings in the beginning of the year. 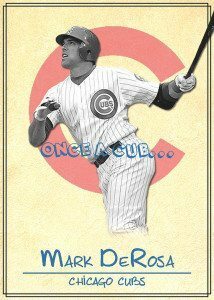 Long term goal is to have a card made and signed by everybody who has played for the Cubs. The Cubs have had almost 2000 players in their history, of which about half are still alive. For the players that are deceased, I’d like to find a cut signature to use. Short term goal is to have all the cards made within the next 2 years and 100 of them signed by the end of 2012. I am also looking to fill in any holes in my collection of mainstream Cubs cards. Thanks again, Matt. I’ll be a weekly reader. Coming Monday: A “Got Balz?” update, with Cuban baseball autograph insights.